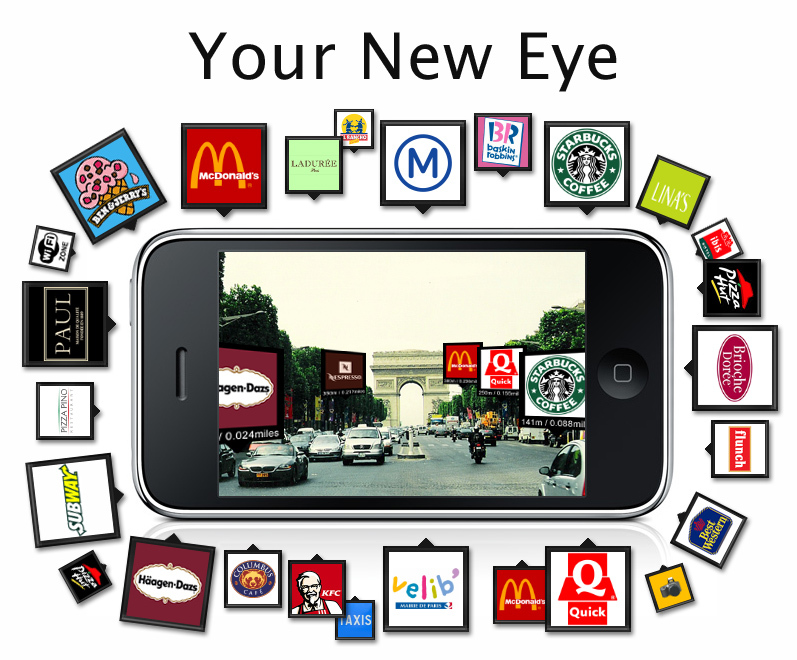 Metro Paris Subway Your New Eye. 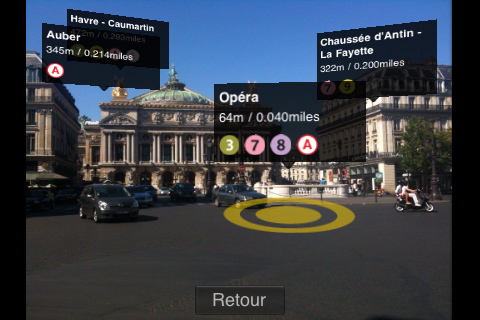 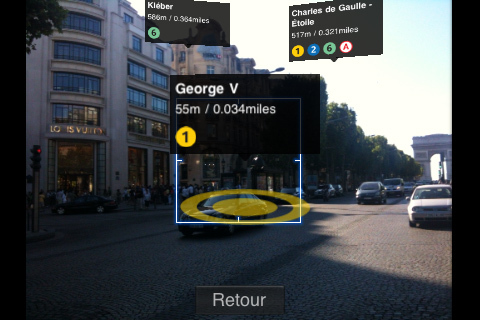 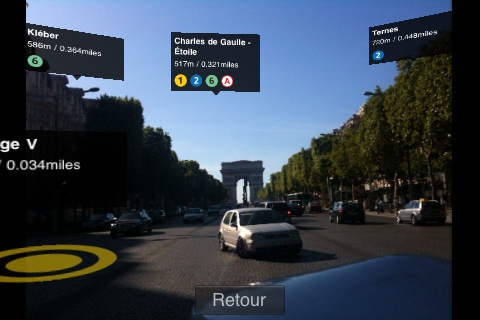 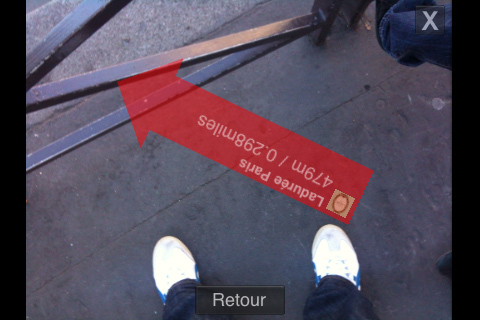 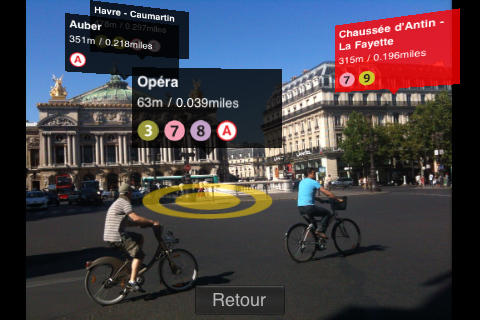 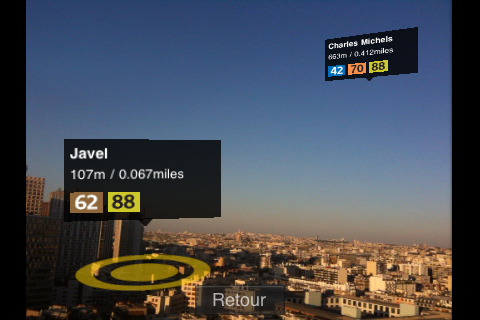 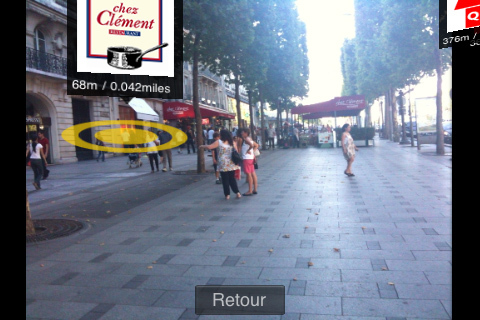 This is a unique augmented reality functionality (only available to iOS4 users with an iPhone 3GS or iPhone 4) that enables you to see the nearest stations and POI with iPhone's camera live view. 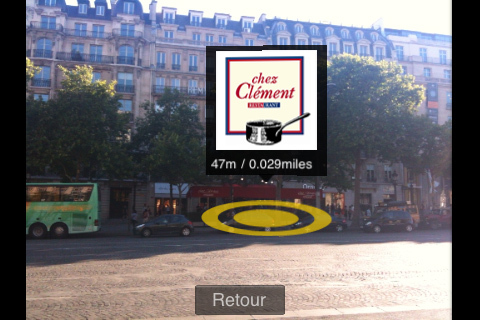 Elements located at a distance less than 1km (0,621miles) only will be displayed. 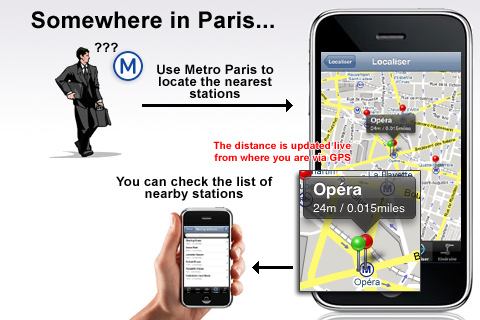 Metro Paris Subway for iPhone and iPod Touch is a comprehensive guide to traveling through Paris, France. 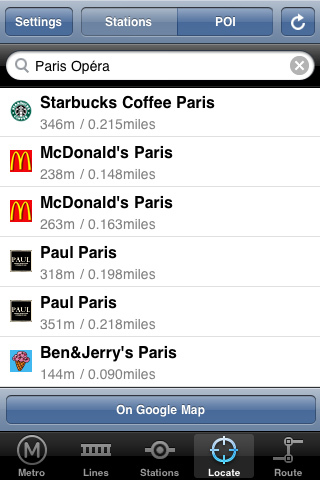 It includes official subway maps. 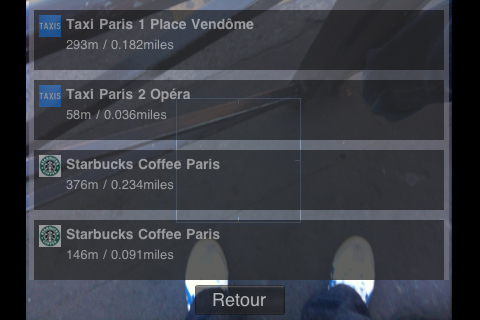 This application is officially licensed by RATP of Paris. 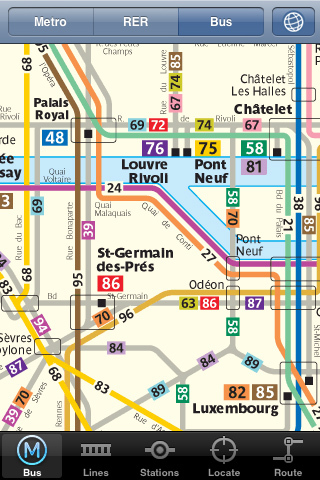 - Latest official map of Paris Metro (2010). 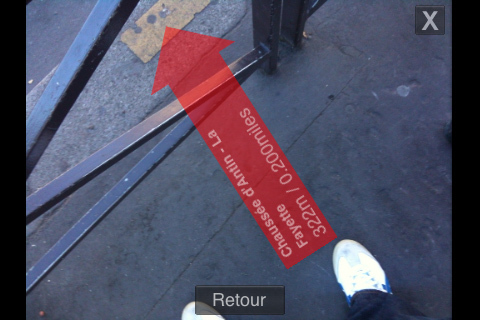 Landscape and portrait modes are available. 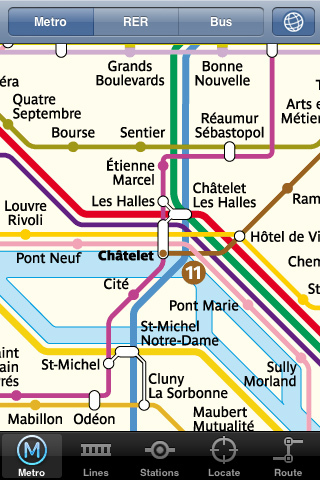 Official map of RER (the additional regional express network of Paris). 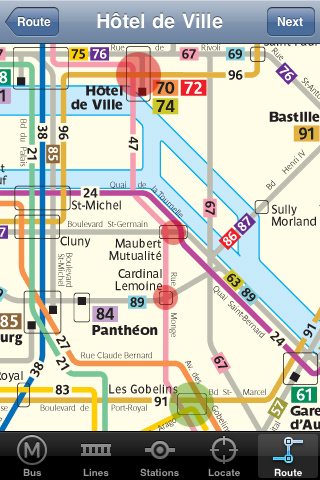 Official map of the Bus of Paris. 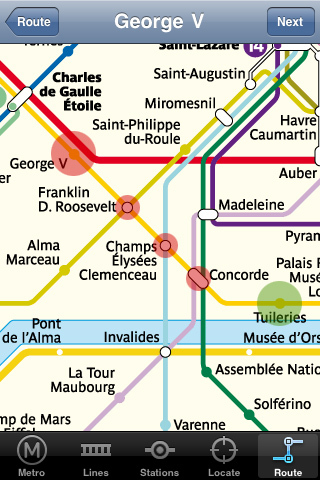 Detailed map of each line in Paris (Metro, RER, Tramway, and SNCF Transilien). 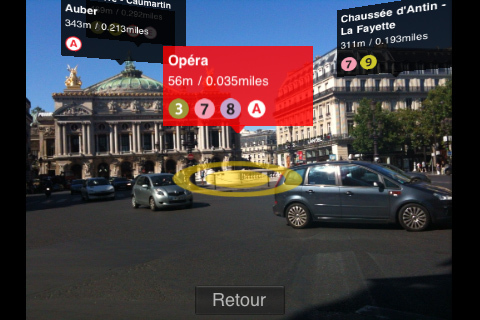 - Precise location of each station on the map (with a red circle). 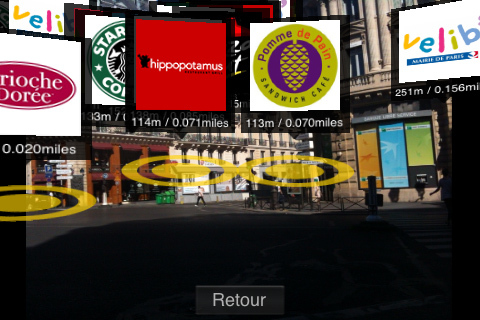 This application is fully compatible with Google Maps, each station is represented by a red pin, a popup shows you the distance, and it's updated live (thanks to GPS) as you walk in the streets of Paris. 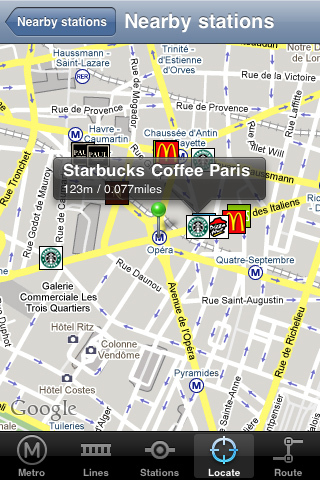 - The journey planner tool allows you to find automatically the best route to get to your destination in Paris Metro. 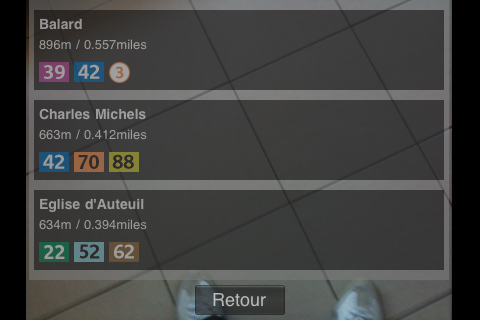 Interactive map to choose your stations for the route. 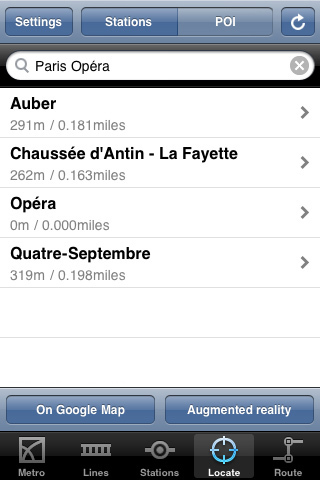 To get better Route results, please switch into Best Route in the settings. 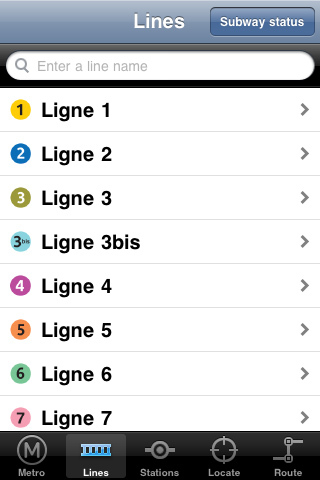 The journey planner does not require a network connection to operate, it works perfectly while in the subway. 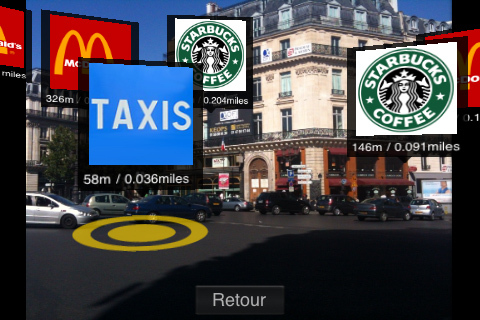 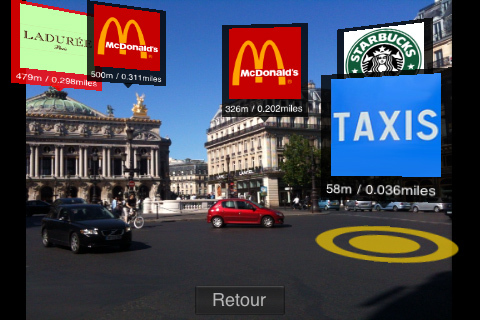 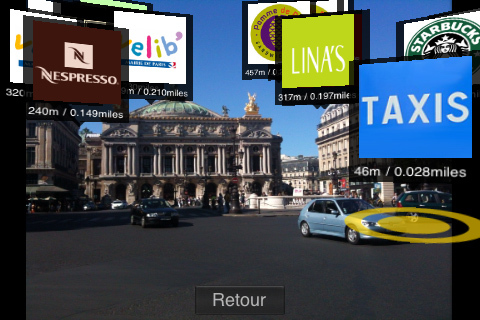 - The application locates the nearest metro stations from your position in Paris. 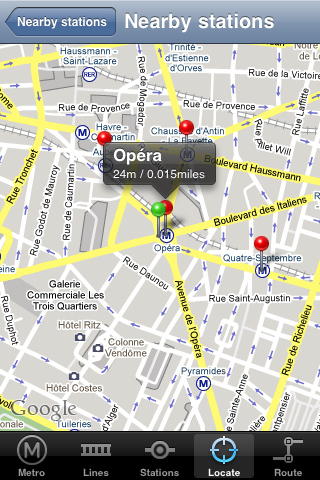 You can also provide an address in Paris, the application indicates the stations closest to that address. 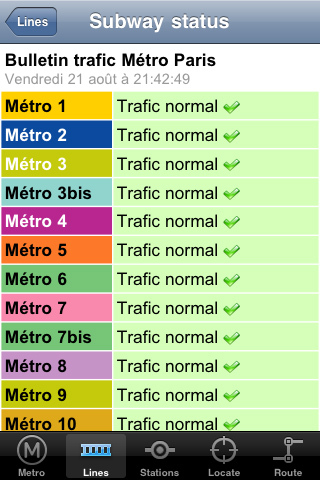 - Metro Paris Subway has added the push notification support that allows you to be notified in background, even if you have closed the application. 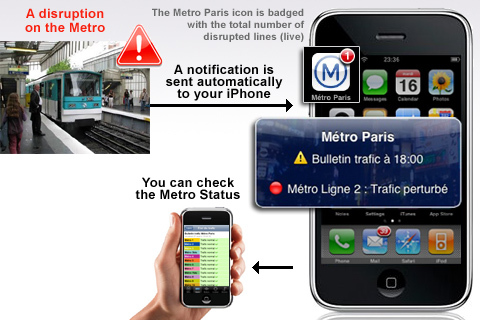 This new feature allows you to receive Paris Metro alerts in real time, when a disrupted line is detected, a notification is automatically sent to your iPhone / iPod Touch. 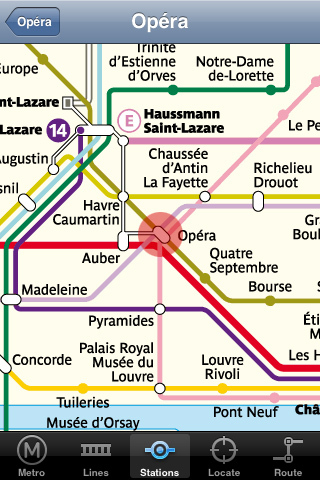 A numbered badge to Metro Paris Subway application icon shows the current number of disrupted lines. 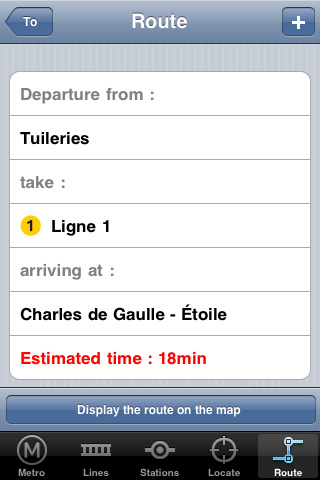 - Paris Bus is now available for the first time in the same application via in-app purchase. 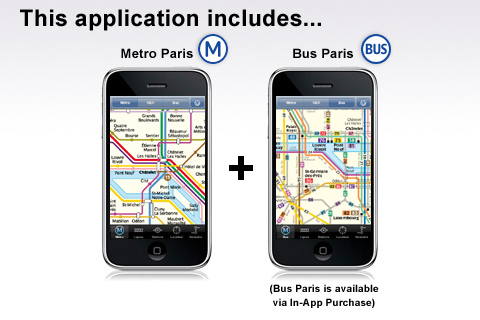 This option allows you to switch between the underground and bus systems at any time using the same application. 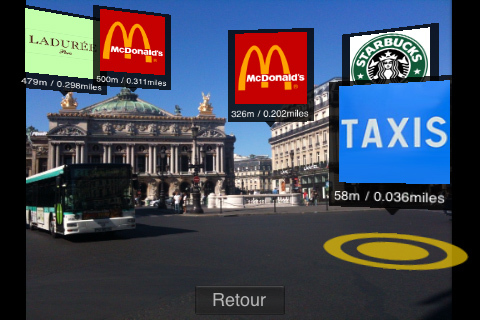 This add-on includes the official Paris Buses map from RATP with the key bus routes, locates the nearest bus stations, and also offers a Journey Planner tool. 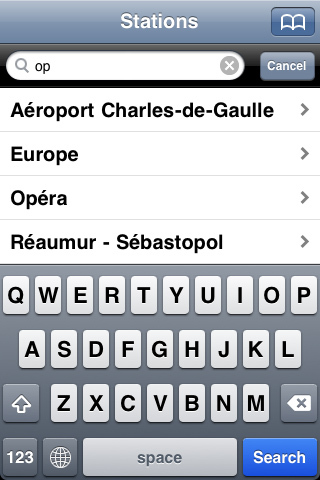 - You can add new Point of Interest (POI) databases to Metro Paris Subway application via in-app purchase. 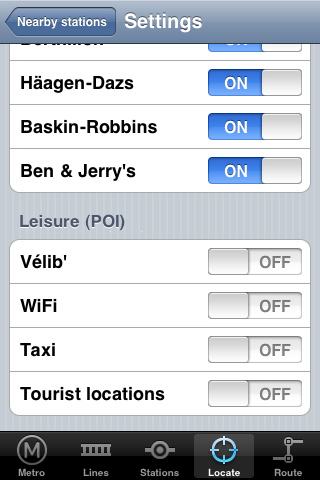 These options allow you to activate Food & Drink POI, Restaurants POI, Coffee, Pastry & Ice Cream POI, Leisure POI, and Accommodation POI in all over France. 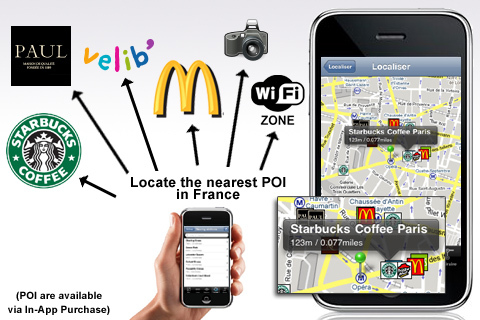 You will be able to locate all nearby POI on Google Map. 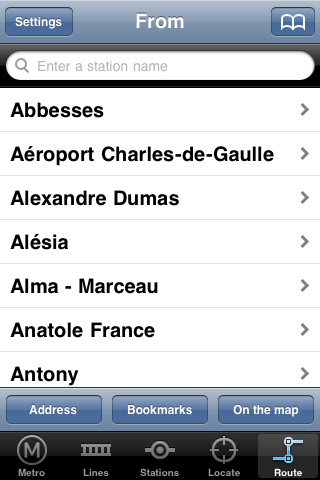 - This application is available in English, French, Spanish, Deutsch and Japanese.